Supercar action on the PSP! 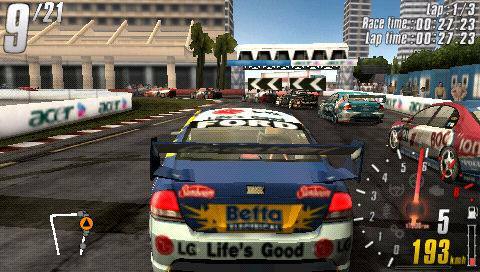 Codemasters brings this port of the title V8 Supercars 3 to the handheld system and it is surprisingly good. The game has been released world wide under various titles with content applicable to the region of release as with its big brother titles on the PS2. The event itself makes it’s way around the planet and you get to experience the adrenaline rush of the different vehicles from around the world. The graphics on this game have made a nice transition from the PS2 and look great. Realistic damage to the cars and a cool physics model make for some insanely good events where you really have to make sure that you need to keep an eye on your car and the key collision points that the car has, as too much damage and you will lose tires and require a pit stop or simply be out of the race full stop. 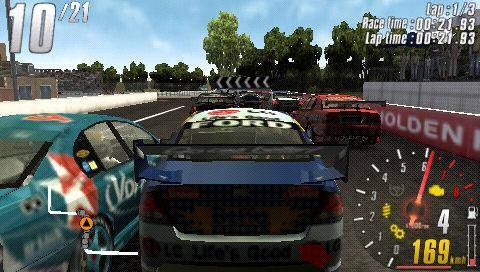 Whilst the game does cover content from around the world and the races most relevant to those areas, this is Australia and the V8 series has been replicated beautifully with all the major tracks shown in gorgeous detail and the rivalry between the Ford and Holden teams most evident. Even the driver roster is included with appropriate advertising and decals on the vehicles. So if you have ever wanted to drive Panorama, here is your chance. Included in the game is the ability to tweak different parts of the car to get better performance and you can tell the difference in how the car performs when you do so. It’s a hell of an incentive to making sure your car is the best it can be. Making your way is not so easy through the world challenge as you would think for the simple fact that there are a number of tests that you must make your way through before you can get into the game proper. These do get somewhat cumbersome and get in the way of an otherwise enjoyable game. They are essential however in order to get the licenses required to compete in the events in the game. There are still some things that do need looking at for future versions of the game. For example the artificial intelligence during the Nascar part of the game is pretty easy to beat once you get a good position in front of the pack, it’s just a matter of staying ahead of them, which you could argue is the case in racing anyway but it just doesn’t seem that they make much effort to beat you once you establish a lead of any sort. The easiest way of controlling any of the cars is through the dpad, with the stick almost useless in this game for any sort of precision handling. I keep waiting to see some of peripheral that will take up some of the slack that is caused by this issue as it is not a fault of this game but rather the PSP itself. This so far would have to be the best racer on the PSP thus far. Sure there are a few factors that are present that take away some of the good times but overall if you are into fast machines that look and sound brilliant then you could go a lot worse then this.